1993 gmc top kick lo pro 24’, prior uhaul truck, 6.0L gas engine, 228,440 miles on odometer but motor was rebuilt and has approximately 55,000 miles on it. Automatic, Eddie Bauer leather seats, manual Windows and locks, bow set up with an inverter for power in the back and also has lights in overhead, 11’ 6" clearance, under 18,000 load. The only known problem is the drivers side door window is broken out otherwise is a good strong truck, have hauled with it fully loaded and never hesitated. Tires have like 75-80% tread on them. Pull out ramp 6000.00 or a vehicle of equal value or best reasonable offer. text only,I hate talking on the phone. 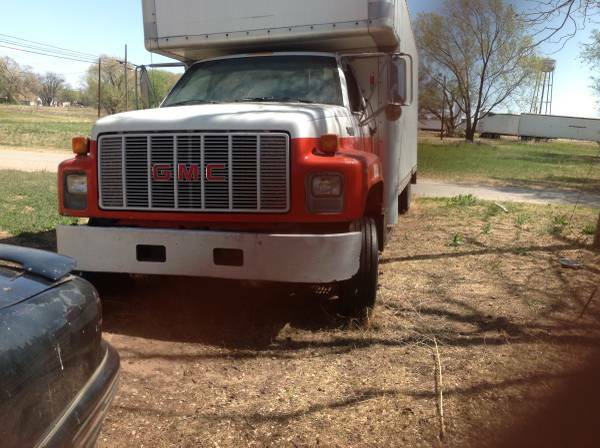 Keywords: gmc, truck, box truck, move, moving, moving truck, work truck, haul, uhaul, trade,bigass truck..